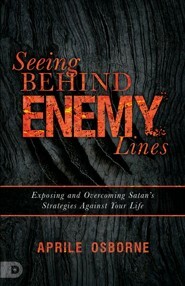 What if you could know what the enemy was plotting, and preemptively derail his plans? Aprile Osborne, a spiritual daughter of Dr. Norvel Hayes, had a supernatural encounter with God where she was given the ability to see into the spirit realm. Specifically, she was shown glimpses into the inner-workings of the kingdom of darkness. In Seeing Behind Enemy Lines, Aprile teaches believers to Biblically implement this insider knowledge for spiritual victory! 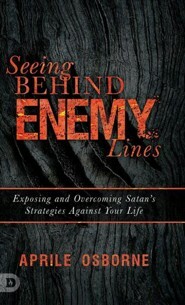 Receive behind-the-scenes prophetic insights on what happens in the devils boardroom. Learn to shift atmospheres and displace the influence of darkness. Activate the power of your Kingdom authority. Understand "chain of command" in the heavenly realms. Identify the multiple stages of demonic assault. Receive insights about Jezebels eviction, the molecules of Heaven, and the thin line between Heaven and earth. You were destined for victory over darkness! Take the offensive position and reclaim what the enemy has stolen! Aprile Osborne has been involved in ministry from a very young age. Her family traveled and ministered with Dr. Norvel Hayes who is her spiritual father and mentor, along with other great men of God. By the time she was a teenager, she had been in services and crusades on four continents. As an adult, Aprile worked under Brother Norvel again as his youth pastor and a teacher at his international bible school and she began traveling to preach at various churches and conferences. 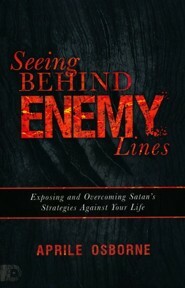 I'm the author/artist and I want to review Seeing Behind Enemy Lines: Exposing and Overcoming Satan's Strategies Against Your Life.